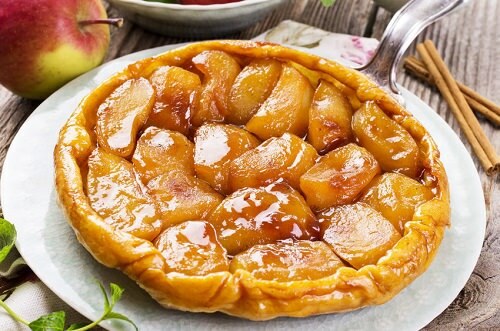 It is a very easy and extremely delicious variant of an upside-down cake, which becomes our autumn subject. Let`s start with making the streusel topping. Preheat the oven to 325°F. Cover the baking sheet with parchment paper and toast the pecans for 12 minutes until golden and let it cool. In a pan cook the oats over medium heat, keep stirring it for 14 minutes until toasted a little. Let it cool. Mix the flour with the toasted pecans in a food processor. Then combine it with the oats, brown and granulated sugar, salt, cinnamon and black pepper. Stir the butter with a fork to form lumps. Place the streusel over the baking sheet with parchment in a layer and bake until brown for 25 minutes. Then let it cool. After it we get down to the cake. Turn the oven on mark 350°F and grease a 10-inch Bundt pan with butter and flour. Combine 1/4 cup of the sugar with the cornstarch, cinnamon, nutmeg and allspice in a large bowl. Add the apples and stir until covered completely. Melt 3 tablespoons of butter in a large skillet, add the apples and cook over a high heat, stir from time to time for them to get soft. It will take about 6 minutes. Refrigerate the apples for 15 minutes. In a bowl combine the flour with soda and salt. Separately mix the Calvados, buttermilk and vanilla. Beat the remaining 2 sticks of butter and 2 cups of sugar with orange zest with a mixer. Add eggs one by one, beat well between the additions. At the low speed, mix the dry ingredients and buttermilk mass. Spread the cooled apples onto the bottom of the Bundt pan and cover with the cake batter, smooth the top. The cake is to be baked for about an hour until ready. Let it cool a little and turn over the pan. Scratch off the stuck apples onto the cake, and till they are hot enough put the streusel topping over it. When the cake is completely cool, it is ready to be served.